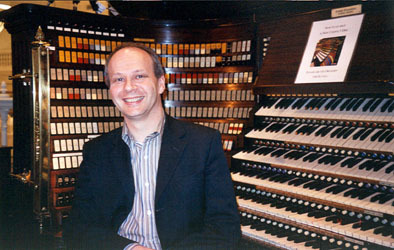 Johan Hermans is at the front of his generation of organists in Europe. He owes his reputation to successful recital performances in cities such as Seattle, Paris, New York, Moscow, London, Hong Kong, Brussels, Adelaide, Milano, Osaka, Rio de Janeiro, Singapore, St. Petersburg, Sydney and Washington D.C. He also has given presentations at, among other venues, the University of Michigan, Ann Arbor; the University of Houston, Texas; the University of Arts in Osaka, Japan; the National Music Academy in Riga, Latvia; the Cultural Center in Hong Kong, China and the Gnessin Academy in Moscow, Russia. Johan has recordings to his credit for Austrian, Belgian, Canadian, Dutch, German, Latvian, Polish and Spanish Radio- and TV Broadcasting Corporations and has made recordings for Motette-Ursina, Sony Belgium, Vision-Air and Pavane Records - receiving notable recognition for his work. He masters a vast repertoire containing works from the 14th to the 21st century and premiered new organ compositions, some of them having been dedicated to him. The recording of the newly restored historic organ of Hasselt Cathedral which he made for the national classic Radio Broadcast “Klara” got published in the CD series “Flemish Organ Treasures” (label Vision-Air). Highlights of the recent past were his recitals as an organ soloist at Notre Dame Cathedral in Paris; the Kaiser Dom in Frankfurt; St. Giles’ Cathedral in Edinburgh, Scotland (Celebrity Recital series); the Cathedrals of Canterbury and Lincoln (Celebrity Recitals) in England; the world famous organ of Cadet Chapel at Military Academy, West Point, New York ; the International Organ Festival of Palma de Mallorca, Spain ; the Philharmonic Hall of St. Petersburg, Russia (“Best Organists of the World” series); his two concert tours through South America and his recital in Singapore. Johan studied at the Lemmens Institute in Louvain and at the Royal Conservatory of Liège, Belgium. He completed his education with a thesis on “Rethoric and Affects in the music of J.S. Bach” and the “Diplôme Supérieur” (the equivalent of a “Doctor of Musical Arts” or “Prix d’Excellence”) in Organ Performance. He was granted scholarships from both the Flemish and the French community of his country to attend international master classes by famous organists in France, Germany, Spain, the Netherlands and Italy. Johan Hermans teaches Organ Performance and Keyboard Harmony at the Municipal Academy of Genk and the Conservatory of Hasselt, Belgium. He also holds the posts of Cathedral Organist of St. Quintinus Cathedral and Civic Organist in Hasselt. He is the founder and artistic director of the International Organ Festival of Hasselt. He is a board member of the American Guild of Organists’ European Chapter and dean of the Limburg chapter of the Dutch organist’s association KVOK in the Netherlands. In April 2005 he was honored by the Academic Society of “Arts – Sciences – Lettres” of Paris.